Voters In Texas City Approve Ban On Fracking : The Two-Way It's the first time a city in the energy-friendly state has voted to ban hydraulic fracturing. The vote in Denton is likely to face legal challenges. From left, Topher Jones, Edward Hartmann and Angie Holliday hold a campaign sign outside City Hall in Denton, Texas, on July 15, 2014. 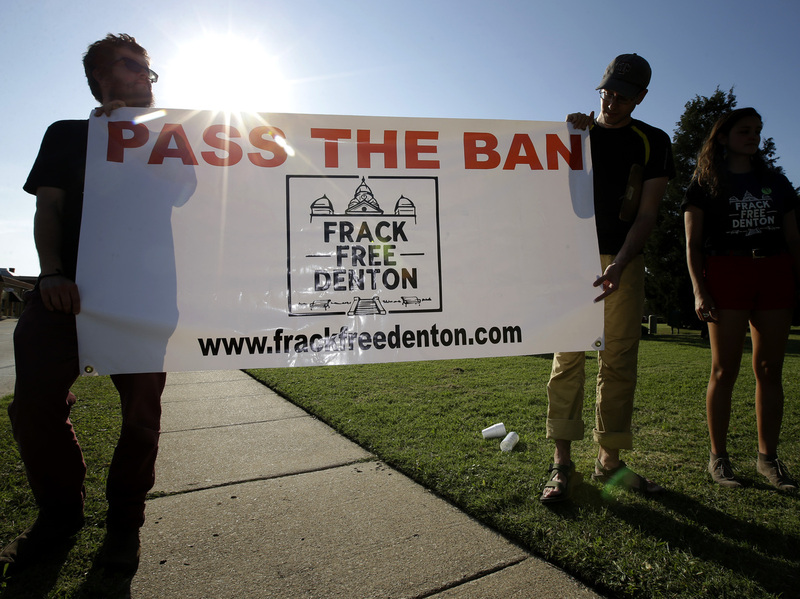 Voters in the college town approve a ban on fracking on Tuesday. "Hydraulic fracturing, as determined by our citizens, will be prohibited in the Denton city limits," he said. Texas Railroad Commissioner David Porter, an opponent of the ban, said voters had fallen "prey to scare tactics and mischaracterizations of the truth." "This issue will continue to be hotly contested. I am confident that reason and science will triumph, and the ban will be overturned," he said. Supporters of fracking say it creates jobs and wealth, but its opponents say the environmental and health risks outweigh any benefits it provides. Cathy McMullen, head of the Denton Drilling Awareness Group, which placed the issue on the ballot, called it a victory for the citizens of Denton. "We know the oil and gas industry is going to sue to try to overturn the fracking ban," she said in a statement. "But we lawyered this ban every which way before launching this effort. And we consulted legal precedents for Texas home rule cities like Denton. And we're confident it will stand up." The ban will take effect Dec. 2. "Frustrated with how the city was handling the situation, McMullen's group petitioned to put the ordinance on the ballot. The referendum does not ban all drilling, only hydraulic fracturing, a technique that pumps water, sand and chemicals underground to shake gas loose from the shale. "But drillers say that traditional wells are not economical and that the ban would effectively stop drilling. They also said the ban usurps the authority of state agencies like the Railroad Commission, which is charged with regulating drilling." The Wall Street Journal reports that residents of Athens, Ohio, also approved a ban on fracking, while those in three other places in the state — Gates Mills, Kent and Youngstown – overturned bans on the technique. In California, voters in San Beniro and Mendocino Counties approved bans on fracking while those in Santa Barbara rejected a similar proposal, according to member station KPCC.